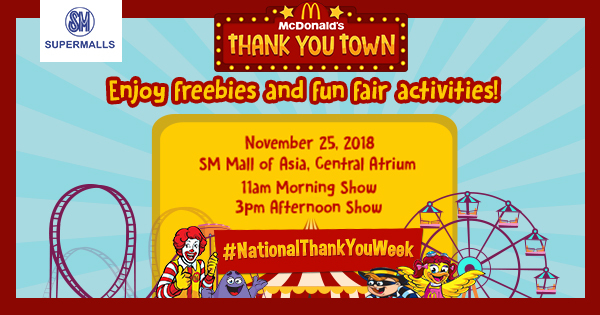 SM Supermalls and McDonald’s recently teamed up for #NationalThankYouWeek which started last November 19th and ends on November 25th. On digital, SM and McDonald’s encourage families to share their thank you moments and get chance to win P5,000 SM shopping money by simply taking a photo using the #NationalThankYouWeek Photo App that can be accessed via smsupermalls.com from Nov. 19 to 25. Meanwhile, as a simple way to say thank you to customers, all McDonald’s stores located in 48 SM malls nationwide will give a free Vanilla Sundae Cone for every purchase of a Happy Meal from 3 p.m. to 6 p.m. on Thanksgiving Day itself (November 22) till Sunday, November 25. A culminating activity is also in store for families on the last day of the week-long celebration (November 25). Kids and kids-at-heart are invited to experience SM Supermalls and McDonald’s Thank You Town where everyone can enjoy an array of fun activities and fun technology games. At the Thank You Town, SM shoppers can also sign up for McDonald’s Stripes Run, avail discounts in booking McCelebrations, and get amazing deals at the Toy Bazaar. On top of the exclusive McDonald’s treats, the Thanksgiving experience of SM shoppers will be made more meaningful with a Thanksgiving Blessing at select SM malls on November 18 or 22 plus special dining offers at SM Foodcourt and other participating restaurants from November 19 to 25. SM Supermalls is the sole Philippine finalist in this year’s World Retail Awards, held last April 19 in Madrid, Spain. SM’s “National Thank You Day,” an integrated live brand experience campaign in partnership with McDonald’s Philippines, made it as a finalist in the ‘Best Customer Experience Initiative – Mall Owners’ category. For more information, check out www.smsupermalls.com, and its Facebook, Twitter, and Instagram accounts – @smsupermalls. Wow siguradong mag eenjoy dito sa sm ang mga kids they have dun and more activities.. Tska may free icecream cone pa pag bumili ng happy meal wow .. Bet na bet nmn ang pa thanksgiving nila. marami ang mageenjoy. Wow ang daming mageenjoy nito.. Ang daming pagive away ni MCDO at ng SM super malls..